I finally saw Greta Gerwig’s Lady Bird at a matinee show yesterday. Loved it. I was so blown-away by the inclusion of the John Hartford song “The Eve of Parting” in the movie. Hartford has been a favorite of mine since my late twenties, when a used-record store purchase satisfied my curiosity about the brilliant composer of the classic “Gentle On My Mind.” It’s always a bit disconcerting when a popular movie or tv show features an obscure tune or artist that belongs secretly to you (or is this a me thing?) “Curse the thought of your existence… Loving every flaxon hair…” wow. Hartford was such a great lyricist. Is it selfish of me not to want to share John Hartford with the masses ? Probably. 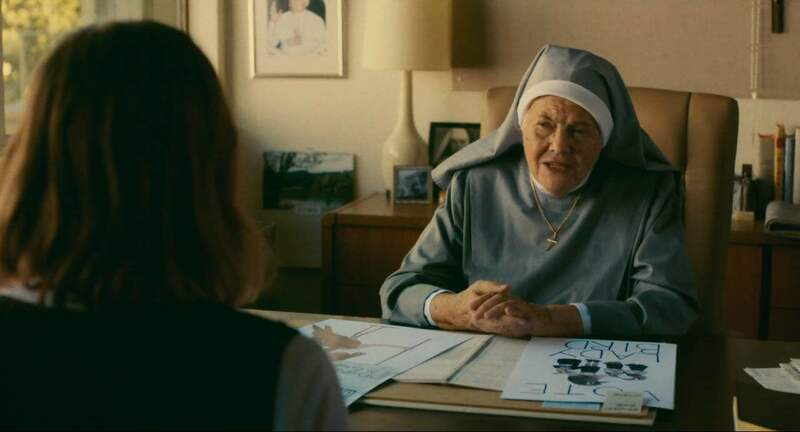 Lois Smith is really excellent in a small supporting role as Sister Sarah Joan. I wonder if young Saoirse Ronan chatted with the octogenarian actress about her experience acting with James Dean in 1956 East of Eden? Like most guys my age, I was crazy about all three of James Dean’s movies, especially East of Eden, and I was smitten with Lois Smith in her very small role as the saloon girl (she sweetly says to Dean/Cal, “Yer just a kid, ain’t ya?”) Here’s Lois Smith’s screen test with Jimmy. She is strikingly beautiful here, at about the same age as Saoirse Ronan is today. Lady Bird’s mom – Laurie Metcalf – steals the movie and will a Best Supporting Actor award. She made me cry, and I love to cry alone at the movies.